This weekend has been another weekend that we’ve been lucky enough to head home for. As we’ve been home and away for the last 6 weekends it’s getting a bit costly either in petrol or train tickets. When National Express offered the chance to work together I jumped at the chance. Traveling by coach wasn’t what I thought it would be like. In my head, it was going to be like the coaches you got on a school trip, old rickety where the seats were that rough funny material and it was stuffy and you were instantly feeling travel sick. Instead what we got was a modern coach with leather seats, a tray table, air conditioning, power sockets, toilets, and most importantly free wifi. Using their VUER app you can watch movies, TV shows and browse magazines. I opted to use the time to listen to my audiobook and scroll through my social media. I’m currently listening to Becoming Michelle which is narrated by Michelle Obama and has just been a really interesting book so far. I also had the chance to take in the scenery something which I don’t get to do when it’s me that’s driving home. I just got to completely switch off and just get comfy and enjoy myself. There were so many benefits to getting a coach, it was quite a quiet day for traveling but unlike the train, we had a guaranteed seat. You can reserve one if you want to sit somewhere specifically but if not your seat will be guaranteed. We also had a suitcase each with us for heading home which was put in the hold. The luggage allowance is really generous allowing you up to 20kg and also a piece of hand luggage each. This is perfect as it’s the kind of rules you’d follow at an airport, they run 1,100 airport services 24 hours a day. As a student, I want to travel using something cost friendly and more eco-friendly than driving two people over 100 miles each weekend. I was actually really surprised to learn that the coaches are so modern that their 56 seater coach performs better on emissions than the average car. It also really didn’t take long at all. At points, I completely forgot I was on a bus. Traveling home usually costs me around £20 or £30. Usually, that’s doubled since we head home as a couple. Had we paid for tickets it would have only cost £7.70 each for the journey we took. 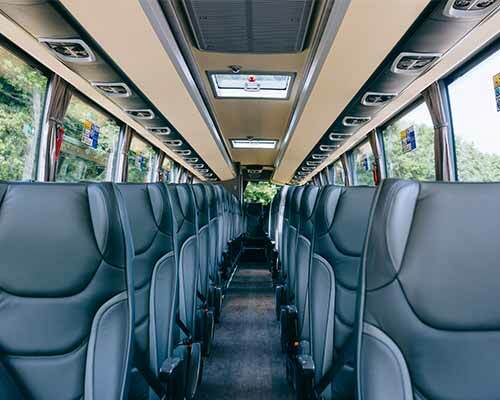 National Express offers thousands of tickets for £5 or less (plus a booking fee). They also offer a young person Coachcard for 16-26-year-olds which costs £12.50 for a year, this allows you to get a third off standard and fully flexible fares, a 20% discount at Pizza Hut, 15% discount for travel to festivals and events. It really isn’t harsh on the bank account at all. I actually really enjoyed traveling home by coach, it’s something I will be considering more often as it really is such good value for money. I’d really recommend them if you are thinking of heading home this Easter weekend. Have you ever traveled by coach? Have you ever considered traveling by coach? Let me know in the comments! *The tickets for this journey were gifted to me in exchange for this post however all thoughts and opinions are my own. Hey Evie! Whenever I hear coach, I think the same thing as you, it’s gonna be like one of those school rides😂 It sounds like National Express has the modern style down, what luxurious ride you had!! I LOVE National Express! Their coaches are so comfy and I definitely have a favourite seat on them that has lots of leg room hahaha. I recently got a return from Bristol to London for £12 which is crazy when you think about how expensive trains are and how you don’t always get to sit down. I’ll always travel with NE!